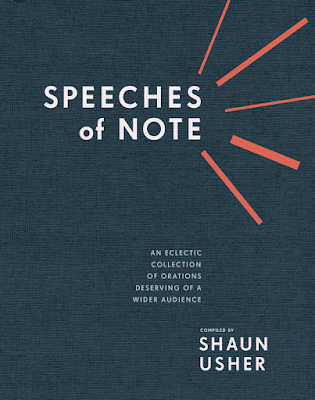 Usher, who previously authored the New York Times bestseller Letters of Note, has created a celebration of old and new oratory with Speeches Of Note. "Speeches hold enormous power," writes Usher. "They can start deadly wars or even bring them to a close. They can expose truths long hidden. They can impart advice so profound as to alter lives. They can celebrate the legacies of those departed. They can persuade a nation to change course. A perfectly pitched speech, delivered at the right time, can bring together people from the most disparate of backgrounds and, if only for the duration of the speech itself, unite them. "In this modern age, as hyper-connected as we are and with technology in our pockets that enables us to record and broadcast at the press of a button, speeches can find audiences reaching the millions when once they might have been heard only by a few. Footage of these speeches is being shared online at lightning pace, racing through vast, globe-spanning networks of like-minded people and achieving a potency and impact that not long ago would have been impossible." The speeches Usher compiles are ones that have long been admired, profound drafts that were never delivered, or speeches that have until now been forgotten. There's George Bernard Shaw's warm and rousing toast to Albert Einstein in 1930 and Kermit the Frog's commencement address to graduates of Long Island University. There also is the chilling public announcement that was prepared for President Richard Nixon in case Neil Armstrong and Buzz Aldrin became stranded on the moon, and thankfully he never had to deliver it. Usher writes, "Indeed, his eulogy was so well delivered that some commentators wondered aloud whether he could one day follow in the footsteps of his late father. Fifteen years later, Justin Trudeau would become the twenty-third prime minister of Canada." This is some of what Trudeau said that day, "Friends, Romans, countrymen. "I was about six years old when I went on my first official trip. I was going with my father and my grandpa Sinclair up to the North Pole. "It was a glamorous destination. But the best thing about it was that I was going to be spending lots of time with my dad because in Ottawa he just worked so hard. "One day, we were in Alert, Canada's northernmost point, a scientific military installation that seemed to consist entirely of low, shed-like buildings and warehouses. "Let's be honest. I was six. There were no brothers around to play with and I was getting a little bored because Dad still somehow had a lot of work to do. "I remember a frozen, windswept Arctic afternoon when I was bundled up into a Jeep and hustled out on a special top-secret mission. I figured I was finally going to be let in on the reason of this high-security Arctic base. "We drove slowly through and past the buildings, all of them very grey and windy. We rounded a corner and came upon a red one. We stopped. I got out of the Jeep and started to crunch across towards the front door. I was told, no, to the window. "So I clambered onto the snowbank, was boosted up to the window, rubbed my sleeve against the frosty glass to see inside and as many eyes adjusted to the gloom, I saw a figure, hunched over one of many worktables that seemed very cluttered. He was wearing a red suit with that furry white trim. "And that's when I understood just how powerful and wonderful my father was. "Pierre Elliott Trudeau. The very words convey so many things to so many people. Statesman, intellectual, professor, adversary, outdoorsman, lawyer, journalist, author, prime minister. "But more than anything, to me, he was Dad." 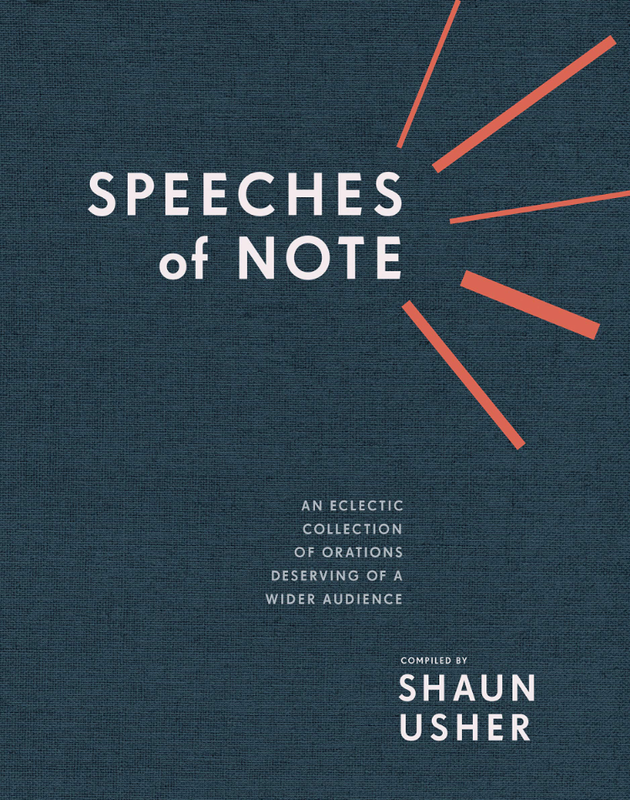 Speeches of Note honors the words and ideas of some of the most provocative and inspiring people in history. These are calls for change, highlights of new perspectives, and ultimately celebrate lives well-lived. Some of these works altered the course of history. This beautifully produced and richly illustrated collection will thrill anyone who appreciates language, rhetorical flourishes, and the unrivaled power of the spoken word. It is perfect for anyone on your shopping list this holiday season.